The word "superfood" gets thrown around a lot, usually with little or no explanation about what makes them so great. Fortunately, researcher Jennifer Di Noia took on the problem by figuring out just how much nutrition certain powerhouse fruits and vegetables deliver. The results, which the Centers for Disease Control published on its "Preventing Chronic Disease" page, assign nutrient density scores to 41 fruits and vegetables, with the final tallies reflecting the daily value percentage of 17 essential nutrients that 100 calories of each food will give you. Confused? Think of it this way: if you eat 100 calories of watercress (score of 100), you'll get 100% of the vitamins you need, whereas housing 100 calories of white grapefruit works out to 10.47%. 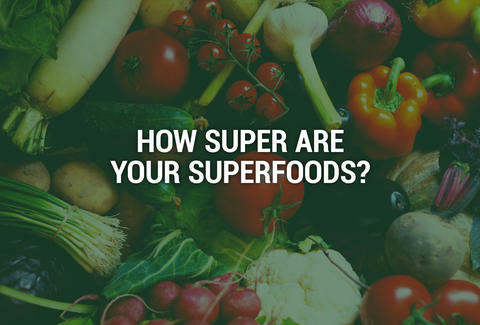 Whether you consider these foods "super" is totally up to you. Anthony Schneck is the health editor at Thrillist, and he really should eat more watercress. Follow him: @AnthonySchneck.